... are in Seattle. So sang teen heartthrob Bobby Sherman in the late 1960s in the theme for TV series Here Come the Brides! In reality, the skies over Seattle are more often grey and overcast, and you often can't see the greenest hills for the rain for a good part of the year. 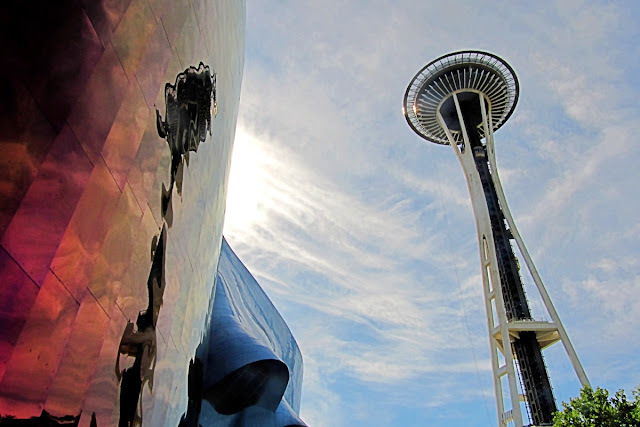 Nonetheless, Seattle is one of our favourite cities to visit. It's small enough that most of the major tourist attractions are easily accessible via public transit. We took in the famed Seattle Space Needle. Unfortunately, another popular attraction The Museum of Pop Culture (MoPoP) was closed for a private event.